RWS Crimped .22 cal / 6mm Copper Coated Steel Acorn Blanks -- 100 ct. $15.99. Exactly what it supposed to do. Not the best value, but still high quality. Gun Dog Supply is one of the best places to get these, as well as their customer service is the greatest. We order several items from Gun Dog Supply, and it doesn't matter what you order, it comes quickly and the customer service is the best for mail order. Thanks Steve! These are working well in my Alpha .22 starter/training pistol. No misfires so far. It is suggested to point pistol down when firing to avoid these short blanks from displacing out of the cylinder. That is how I fire them and haven't had any problems. Price/value is as good as I've found anywhere. Delivery was quick! They work every time I fire one, excellent product, will buy again. I am a gunsmith who uses these rounds for testing .22 guns I'm repairing. However, they are the best option for blank guns being used for dog training, etc. You get the desired sound without the damaging pressures associated with the blanks found at hardware stores. You guys are GREAT!!!!! I couldn't find these anywhere but here. Price, shipping etc ...can't ask for better service. Thanks again. Works perfectly in the old training gun I have. Quick delivery and follow up emails. I don't have a dog. But I just have a very old pistol. I searched many places and could not find these. I am so glad I found your web sight. They work great. Nice product at the best price I could find online. Fast ship and great communications from the seller. I use these crimps for gunshot control with my K9 partner. I have had no issues with these crimps. In 100 shots I have had no misfires. I used these blanks to fire replica prop guns for a stage production of Frankenstein. They worked very well, and were louder and more consistent in volume than the Walther brand I had been using. Very frustrating what is happening to the supply and price of ammunition in America. "Great for training a young dog." Perform well for training, not overly loud. Great for training a young dog. They work flawlessly. They are not loud, but they are perfect for puppy training or trying to work with a timid dog. "Fast shipping, and first class service." Fast shipping, and first class service. "They work great with very little duds." They work great with very little duds. Would buy again, which I have. Plenty loud for initial exposure. "The crimp .22 caliber works great for introducing pups to gun fire." The crimp .22 caliber works great for introducing pups to gun fire. Product worked as advertised. Quick delivery. Perform consistently, no misfires. Received product very quickly as well. Purchased for my Dad who is training his new pup. He had a training pistol from the 1970's, and this product worked in pistol. Great service overall and arrived quickly. Found this little gun at a yard sale and had no idea what it was. It was being sold as a cap gun. I found the gun on the internet and saw that these blanks went into it. They work great. My previous blank pistol (32 with adapters) used 209 primers which are easier to load than these little blanks, but the acorn blanks seem to be as loud. Just wish they were easier to load. Through about 20 rounds, no duds so far. Maybe it's my blank pistol, but these blanks do not stay in place well in the cylinder. Order was fast and correct. Good company. Would order other products. These blanks did not fire as should in my blank gun. When they did fire so would one or two more at the same time! Will not buy this brand again. My gun? Others worked well. Not compatible with 209 Primer Pistols. Please use caution when firing these blanks in 8 shot revolver blank pistols. Tight chamber spacing combined with opening in end of blank can cause the blank being fired to set off adjacent blanks. 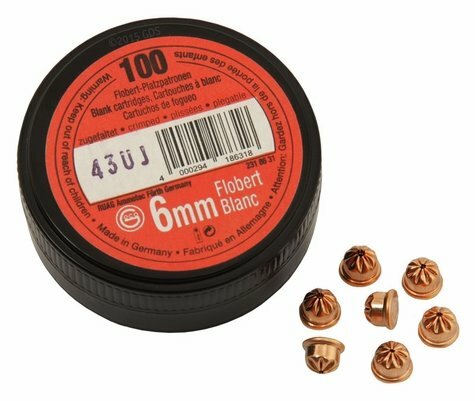 When using these blanks with the Alfa or Viper pistol, there is the potential for the pistol to jam if the cylinder is advanced when the pistol is not pointing down. RWS Crimps are among the smallest and the quietest of the .22 blanks that we sell and use smokeless powder. This crimped blank is sometimes referred to as an "acorn" blank because they look like small acorns. 100 per can.